The book was written in 1934 with blessing and direct participation of the Abbot of the Shaolin Monastery Reverend Miao Xing nicknamed "Golden Arhat". Book are about methods of acting on acupoints and their practical application in Martial Arts. 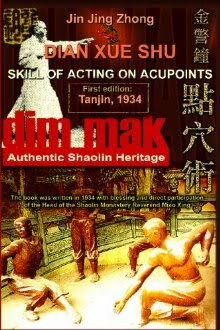 DIAN XUE SHU that is literally means "The Art of Touching Acupoints" is more known in the West as DIM MAK ("Blows at arteries" in Cantonese dialect) or "Death Touch". It should be noted that the last two names do not fully reflect the essence of this method. DIAN XUE SHU is a profound teaching which is closely connected to Chinese traditional medicine. Besides the martial aspect, it includes a wide range of methods of reanimation and medication. In addition to theoretical fundamentals, the books give detailed description of the localization of basic acupoints, methods of acting on them with the aims of combat, reanimation and medication, effects of acting on a particular point, methods of exercising fingers and palms, blow techniques etc.